Russia has seen a renewed interest in regional elections as voters look to change the system from the bottom up. 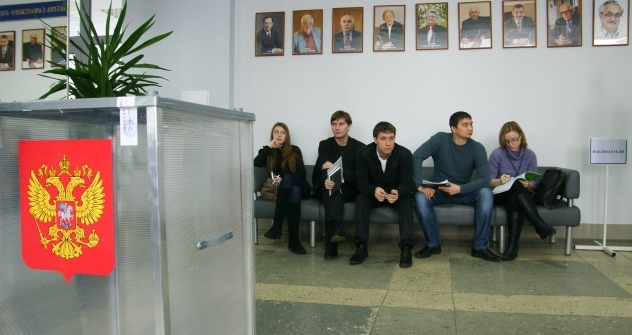 During regional elections in October 2011, most ordinary voters had very little interest in who was running for posts in regional admininstrations, much less how to do so themselves. As a rule, regional offices were won by getting the approval of local and federal bureaucrats – who wanted to keep their critics as far from the office as possible. Yet within only a few months, some important transformations came about. “The emergence of some clear opposition movements in the country destroyed the bureaucratic monopoly on forming local governments throughout Russia,” said political expert Vadim Dryagin. Having found itself at the forefront of civil protest, Moscow was the first city in which candidates from outside the party of power won positions in district administrations. Although municipal councils have limited authority, the opposition hailed the victories of independent and opposition candidates – many of whom had never been engaged in politics before – were elected to the local bodies. The struggle for the local administrations spread from Moscow to the regions. Much to the surprise of many observers, United Russia candidates were defeated in mayoral elections in Yaroslavl and Tolyatti. In Astrakhan, when Just Russia candidate Oleg Shein was declared the loser after exit polls showed him in the lead, Shein went on hunger strike, saying the vote had been rigged. A team of opposition leaders, including Alexei Navalny and Ilya Yashin and dozens of activists, flew from Moscow to support the striker. In response to some opposition demands, before leaving office, President Dmitry Medvedev passed a bill reintroducing direct elections of governors as of June 1, reversing the decision made by President Vladimir Putin in 2005 to have governors nominated from the federal center and confirmed by local parliaments. Other changes to electoral law made it easier for opposition parties to be registered and opposition candidates to get on ballots. Yet critics have called these half-measures, saying that established bureaucrats still have powerful tools for controlling access to regional. For example, in order to run for governor, independent candidates need to collect more than 5 percent of the signatures of municipal deputies or heads of municipal councils – a difficult task if the party of power still controls the local councils. Many opposition activists, however, seem euphoric at the idea of having free elections and engagement in the political process, said political analyst Dryagin. The opposition now has a core of participant who want to do more besides protest, and winning elections at the local level seems like a reasonable way forward. “Rallies and marches are not enough – people get bored and want something specific. People need to hear declarations that everyone is going to the regional polls, that it is a must to participate in order to probe into protest moods at the regional level,” said Valery Khomyakov, another political expert. These efforts will come to a head in the fall, when several Russian regions go to the polls to elect governors under the new law. Dmitry Gudkov, a Duma deputy from Just Russia, has already said that the opposition would nominate its first candidate in early June, to run for mayor of Krasnoyarsk. The Republican Party, which was established in 1990, banned in 2007, and reregistered in April, is getting ready to challenge United Russia. Party leader Vladimir Ryzhkov has said that his party is planning to test the new election laws in Novgorod, Blagoveshchensk, Amur, Bryansk and Belgorod. Yet Moscow and St. Petersburg are likely to see the most heated battles for seats on city councils. “The Moscow City Duma campaign is critical for the opposition, because enhancement of their representation in the Moscow government could become a real political goal for angry citizens,” said political expert Mikhail Remizov. So far, the federal authorities are not taking any actions to discourage the increasing political activism. Some experts believe that the authorities may even welcome new blood in the local bureaucracies. “The mopping up of the governor corps is a result of the previous appointees not living up to expectations and failing to gain prestige locally,” said Vyacheslav Pozgalev, who served as governor of the Volgograd Region from 1996 until 2011. Despite the excitement surrounding the changes in Russia's electoral politics, the new competitiveness places a burden on both ordinary voters and opposition candidates. Voters will now have to pay more attention when choosing a candidate to support, and candidates will actually have to be prepared to deal with real local problems. “It is on the basis of the local councils that Russia’s civil society can emerge, when people with differing viewpoints have to work out a concerted position in order to govern their area together,” said Vadim Dryagin.